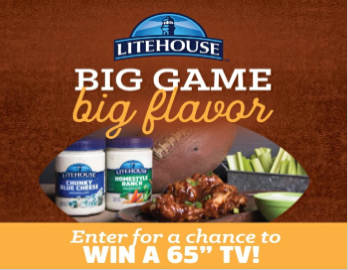 Litehouse “Big Game Big Flavor” Sweepstakes – Win a 65″ TV! ENTER SWEEPSTAKES HERE – Litehouse Foods Sweepstakes page. ENTRY LIMIT – Entrants are eligible for one (1) entry daily during the duration of the promotion and may earn bonus entries by following the steps on the entry page. ELIGIBILITY – The Promotion is open only to legal residents of the United States and Canada (excluding Puerto Rico, Quebec, Canada, Rhode Island, Florida and New York and all U.S. territories and where prohibited by law, rule or regulation) who are 18 years of age or older and have reached 18 years of age in their state as of January 18, 2019. SWEEPSTAKES ENTRY PERIOD – The Promotion begins at 12:00:01 a.m. Pacific Time (“PT”) on Friday, January 18, 2019 and ends at 11:59:59 p.m. PT on Saturday, February 9, 2019. PRIZES – One (1) grand prize available (approximate value of $700): A 65” TV. WINNER’S LIST – For a list of winners send a self-addressed stamped envelope for receipt March 9, 2019 to: Litehouse Promotions 100 Litehouse Drive, Sandpoint, Idaho 83864. (WA and ID residents may omit return postage).